Put simply, the English Votes for English Laws procedures provide MPs representing constituencies in England (and England and Wales) the opportunity to veto certain legislation that applies only in England (or England and Wales). This means that legislation affected by the procedures must receive the backing of both English (or English and Welsh) and UK-wide MPs – something often called a ‘double veto’. In the sections below we explain in greater detail how the EVEL process works. A fuller account is available in our report, Finding the Good in EVEL. England, Wales and Northern Ireland (but this applies only on Finance Bills, which implement the budget). Both primary legislation (i.e. bills, which if approved become Acts of Parliament) and secondary legislation (i.e. statutory instruments, such as ‘regulations’ and ‘orders’) can be certified. The Commons Speaker is required to consider for certification most government-sponsored bills that are before the House of Commons, as well as some secondary legislation. The procedures do not apply to private members’ bills (i.e. bills sponsored by MPs who are not government ministers). second, that it would be within the power of at least one devolved legislature in a different part of the UK to make comparable provision. So, for example, for a clause to be certified as relating exclusively to England and Wales, the Speaker must be satisfied that the entire clause applies only in England and Wales, and that the Scottish Parliament and/or the Northern Ireland Assembly would have the power to make equivalent legislation. If the Speaker concludes that both parts of the two-part test are met, he or she will issue a ‘certificate’ confirming this. Once the Speaker has issued a certificate for any bill (which may relate only to particular clauses), its passage through the House of Commons is then slightly different to usual. The EVEL procedures do not in any way alter the passage of legislation through the House of Lords. The revised legislative process is shown in the following diagram. As shown, once a bill has been introduced, the Speaker conducts his or her initial certification. The bill then passes through most of its stages in its usual way (with the potential exception of committee stage, described below). This means that MPs from across the UK are entitled to speak and to vote – including to amend and vote against the bill if they wish. At the conclusion of report stage (the final stage during a bill’s initial Commons passage at which it may be amended), the Speaker must re-examine the bill and certify any provisions that meet the two-part test. 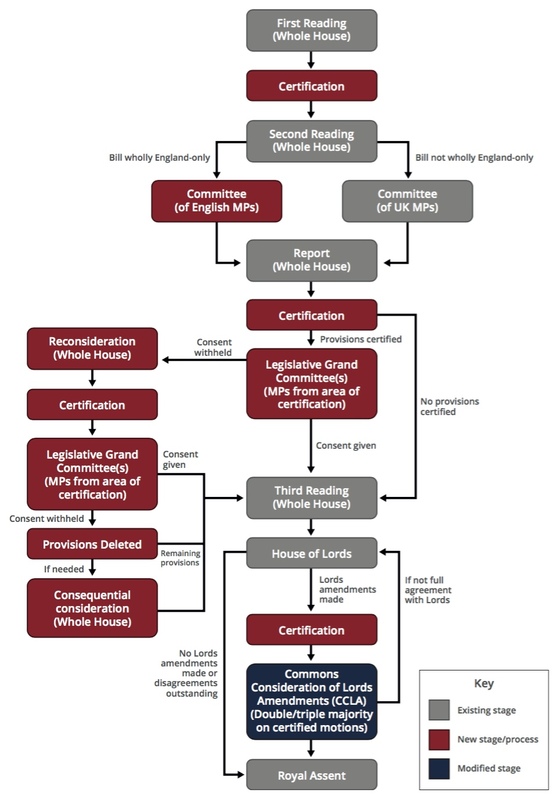 If at this point the bill includes any provision certified by the Speaker, this triggers the need for new ‘legislative grand committee’ stages, which are the mechanism through which English (and/or English and Welsh) MPs may veto those provisions. The legislative grand committees consider ‘consent motions’ (which are roughly analogous to the consent motions considered by the devolved legislatures). If the legislative grand committee(s) approves its consent, the bill passes to third reading as usual. But if consent is withheld, this triggers a series of new stages to resolve any disagreement. If consent is withheld a second time, the English (or English and Welsh) veto is automatically applied, and the affected provisions are deleted from the bill. Any surviving provisions of the bill then pass to third reading stage, at which MPs from the whole UK may vote on whether or not to approve the bill in its final form. After third reading, the bill may pass to the House of Lords. If the Lords amends the bill, its amendments must be approved by the Commons (known as ‘Commons consideration of Lords amendments’ stage). The Speaker must examine all motions relating to Lords amendments at each CCLA stage, and certify any that meet the two-part test. If any such motion is put to a ‘division’ (i.e. vote), a ‘double majority’ is required. This means that, in any division, a majority of both UK MPs and those representing constituencies in England (or England and Wales) must vote in support of a proposal for it to be approved. If every clause and schedule of a bill is certified by the Speaker as relating exclusively to England, its Commons committee stage will be taken by a committee composed only of MPs representing constituencies in England and reflecting the party balance in that part of the UK. No comparable provision is made for England and Wales-only bills. This aspect of the EVEL system does not constitute a veto right for English MPs, because any changes made by this committee may in principle be overridden by UK-wide MPs at the subsequent report stage.